It’s a multi-session communications retreat in a box! And with Verbal Mastery, this eleven-part audio program, you’ll have unlimited access to the world’s top communication experts any time you want. Become a clever conversationalist and confident communicator, never at a loss for words in any social or work situation. From your choice of words to how to use them to work a room, the Verbal Mastery audio suite offers hours of techniques to increase your speaking power. 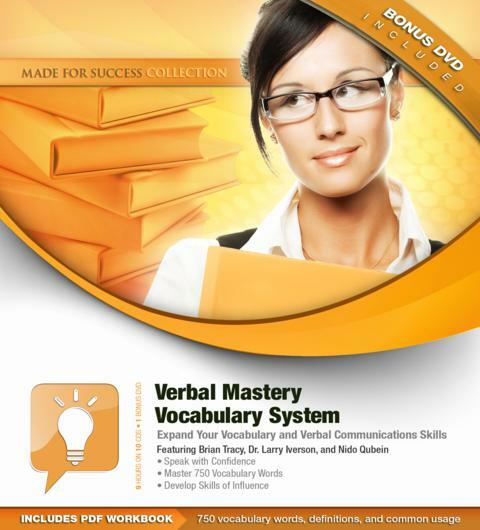 Also included is the Verbalicious PDF workbook with helpful vocabulary words, definitions and common usage. Finally, master the language of success and become a verbal superpower with George Walther’s DVD, Power Talking: What You Say Is What You Get. Included are the essential you need to speak fearlessly, command more respect, gain credibility, write with greater clarity, reduce social awkwardness, and, most importantly, increase your earning potential. Includes a Bonus DVD by George Walther and a PDF workbook. Use the workbook to enhance your verbal skills with the entertaining & educational vocabulary learning system Verbalicious by author Liv Montgomery. Brad Worthley is an accomplished consultant and behavior-change specialist with over 30 years of business management experience. He is also an internationally acclaimed leadership, customer service, and motivational expert. Nido Qubein is president of High Point University, chairman of Great Harvest Bread Company with 218 stores in 40 states, and chairman of Creative Services, an international consulting firm. He is one of America’s foremost speakers on business management, leadership, communication and success. His many books and audio programs have been translated into nearly two dozen languages and distributed around the world. He shares important strategies and techniques that help you to communicate more effectively with others. Dianna Booher works with Fortune 500 companies such as IBM, Boeing, and PepsiCo. Join this expert in accessing the wisdom of this industry expert on subjects such as public speaking, interpersonal skills, and customer service. Chris Widener has shared stages with top political figures and professional athletes, and shares with you the secrets he has shared with executives at G.E. and Harvard Business School. George Walther is an acknowledged expert at boosting your sales, customer service, and communication effectiveness. His three books, PHONE POWER, POWER TALKING , and UPSIDE-DOWN MARKETING have all been published around the world in many foreign language editions. George is one of fewer than 100 professional speakers to hold the National Speakers Association’s highest award for platform excellence. Liv Montgomery takes a fun, entertaining approach to communication, mind power and motivation for today’s busy business person. By distilling the magic of multiple disciplines into what she calls Edutainment, Liv has spent more than a decade developing the proprietary training methods she uses to produce quantum results with her clients in business and life. Liv’s background in big-time marketing and media production – combined with her experience as a certified Life Coach, Hypnotherapist and NLP Practitioner – creates a unique chemistry that’s like rocket fuel for the mind.